I could have had a review for this game done so much sooner, especially since I've played the PS2 version a year ago. I had bought a used copy of this for the GCN last year, and it was defective! So, after three months, I finally got a refund. But I didn't get Aggressive Inline until many months later, pretty much because I was afraid that this may be one of those games that decides not to work with the system (such as the problems I had with Air Force Delta and my Dreamcast, but that ended with me getting MSR, which I wanted so much more). I figured for $14.99, what the hell. As it turns out, the game works. I'm now more cautious than ever about buying used games, since I've had 3 that seemed to have not worked at some point. Ok, I think we should start talking about the game. And since I've played both the PS2 and GCN version, there will be comparisons, and you will see the same review for each console version (eliminates work for me). 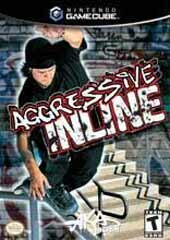 Aggressive Inline is one of the better entries in the extreme sports market, due to it's tight handling, expansive level design, unlimited time during stages and just being quite fun to play. In a way, it reminds me of Jet Grind Radio, minus the tagging. Here, you go through different places such as a film lot, a snowy town, an automobile manufacturing facitlliy and more. Scattered through these stages are challenges you can try to accomplish, ranging from point goals to time sensitive activities. Since the game has unlimited time, you never feel rushed to try and accomplish a goal or two within a very limited amount of time. Instead, you're given a "juice meter", which when filled, keeps the game going. If you miss a trick, or just stand there idle, you'll lose juice. Lose all the juice, the game is over. But, you can keep the meter filled by doing tricks and collecting the boxes scattered along the stages. It's not hard keeping the meter full, in fact, I think there was only one instance where I ran out of juice. It just doesn't happen often. The trick system is very simple compared to other extreme sport titles. For air tricks, you really only use a direction and one button, and rarely a spin if you need it (so I guess there's two buttons for air tricks). Grinds are also a one button function, and can be modified by using the directional motions. Manuals can also be done, as well as a cess slide to keep your combos going. It's a fairly easy and intuitive trick system, and the only tricky thing about it is timing the cess slide to a manual to keep a combo going (actually, I figured out how it works when I figured out the revert move in THPS 4). The controls are pretty tight in this game. I think the players move a little more quickly here than in other games in this genre, but that's kind of the pace the game follows. Controls are stable whether your skating on land, or grinding on a surface. It's not hard to grasp. And those who say that the Gamecube version has a less ideal control scheme for this game are insane. I found the GCN version as easy to control as the PS2 version. In fact, I like the tension of the Gamecube's stick more than the PS2's. Either way you go, it's easy to control. The graphics are pretty similar on both systems. The game started out on the PS2, so you will see a lot of PS2 textures ported over into the Gamecube build. I wish the textures of the GCN build were sharper, but they aren't as crappy as some games that get ported from the PS2 to this system. While both share the large stage design, the GCN version can pull off a constant 60 FPS while the PS2 version may have a little instability in the framerate department. I do not recall any horrible framerate issues, but there is some "here and there" problems. The GCN version also looks smoother thanks to anti-aliasing. The sound is pretty good, and has a fairly good soundtrack as well. Unlike THPS 4, I've actually heard some of the songs in this game, including "Crawling In The Dark", "Your Disease", and "Youth Of A Nation". Neither have Dolby Surround support, but since I do not have a stereo that supports this, I don't care. Both versions sound pretty similar, the GCN version may be a tad more muted than the PS2 version. But many games I've played on the PS2 usually has music that kind of drowns out the sound effects a little. So, it's kind of hard to compare. Between the PS2 and GCN version, they are pretty damn similar to each other. I think the GCN version is just a little better due to the smoother lines and framerate. If you do go for the GCN version, you might as well buy a memory card with it (unless you have an MC 251). This will take up 57 of 59 blocks on a memory card. The PS2 version is kinder on the memory card (it's around 400k). Either way, this is a pretty good extreme sports game, and it's too bad we probably will never see a sequel since Activision now owns Z-Axis. While the game still retains similar mechanics of Dave Mirra 2, it's much tighter and more fun to play than even some of the Tony Hawk games out there.